This recipe is reprinted with permission from Preserving the Japanese Way: Traditions of Salting, Fermenting, and Pickling for the Modern Kitchen by Nancy Singleton Hachisu, ©2016 Andrews McMeel Publishing. In the book, Hachisu tells not only of the traditional methods of preserving in Japanese culture but of her journey to learn and conquer these traditions as an American-born wife to a Japanese farmer. These umeboshi, salted plums, are a traditional delicacy, often eaten with rice. I gained immeasurable self-confidence through making umeboshi myself. After my mother-in-law died, my husband tried to deal with the ume from our trees, but since he is busy, his method was to store the salted ume in alcohol (not my favorite). Recently I have heard more and more reports of ume trees all over California planted by the Japanese immigrants who came to the West Coast in the early 1900s. The ume should be ready to harvest in June, so look out for them. I harvest the ume with Tadaaki’s youngest aunt, Katchan. The harvest time is tricky, however, and is one more test (Will I gauge it right this year? Will I have time to pick the ume on the exact day they have to be picked? Will I be the good farmwife?). Even if I check the ume each day as the time nears, somehow I always end up sifting through the weeds to gather any windfall fruit that has not discolored. It only takes about one day to develop brown spots on the skins in the damp early summer. Another twist is that we have trees in three different spots, and one of the trees is a completely different variety, so they all ripen at slightly different intervals. But the work is worth it because umeboshi, if stored well, never go bad. Also, homemade umeboshi are much, much better than store-bought. Photographer Miura-san still talks about my umeboshi as the best he has ever tasted, probably because the trees are heirloom varieties and I use good salt—still, I’ll take the compliment. Place the ume in a pail and fill it with cold water. Soak overnight in a cool spot, then dump the water and transfer the ume to a large wooden, ceramic, or food-grade plastic tub. Measure the salt over the ume. Distribute the salt with your hand, making sure not to make cuts on the fruit with your fingernails. Place a clean muslin (or food-grade plastic) sheet across the surface of the salted ume and drape it down the sides of the tub. 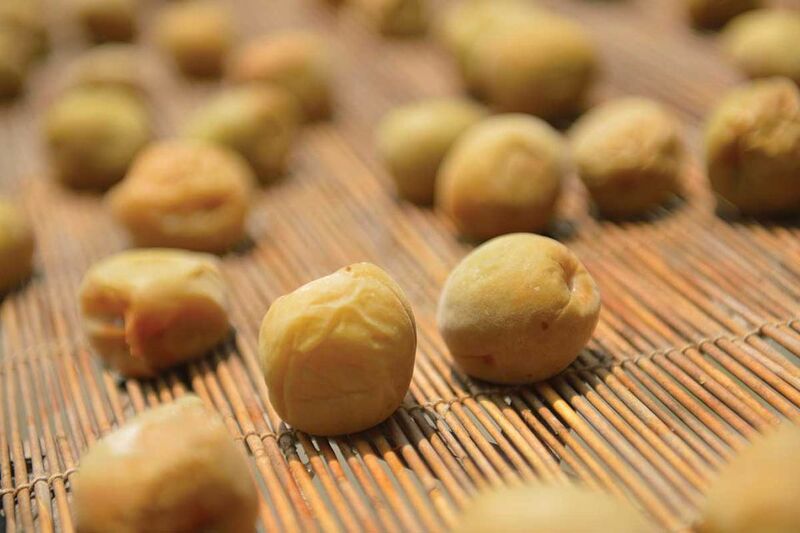 Store these salt-weighted ume in a cool dark spot, but check after 2 or 3 days to make sure the brine has surfaced. If it has not, you should massage any residual bottom salt up to the top fruit. The ume should remain in the brine for several weeks until the weather turns sunny but check periodically to make sure no mold is forming (if it has, pick the mold off carefully). After brining for at least 3 weeks (2 weeks for small ume), dry the ume for 3 days in the bright sunlight (they do not have to be consecutive days) on rattan mats (or the equivalent) stretched across a wooden frame for good air circulation. At night return the ume to the pickling pot. On the last day of drying, strain the brine left over in the bottom of the salting-tub through a fine-mesh strainer and store in a clean jar or bottle. This is called plum “vinegar” (umesu). I refrigerate my umesu; Tadaaki does not. Pack the dried ume (umeboshi) in resealable gallon-sized freezer bags (fill the bags only half full). A syrupy liquid will pool at the bottom of the bags that aids in the long-term preservation of umeboshi. Umeboshi keep indefinitely at room temperature packed in airtight resealable bags. Variations: Some people add Salted Red Shiso Leaves to the salt-weighted ume while they are waiting for the sun to come out (typically, the red shiso is not yet ready to harvest at the time the ume ripen, hence the later addition). Dry the salted shiso leaves at the same time you dry the ume. While I have never tried it, it may be possible to make these with green apricots instead of sour plums. Pickled Ume - What Are Umeboshi or Umezuke?